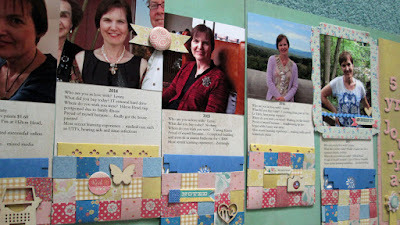 Lisa E Design Blog: My 5 Year Journal - Complete! My 5 Year Journal - Complete! Well, almost. I have just a few days left to finish 5 years of journaling a few words a day in my 5 year journal! Each year I answer 'none' because I'm not a movie person. September: How old do you feel? The first two years I answered older than I am, then a little younger feeling, and by this year I felt younger than I really am because I now weigh what I did in the 90's. Here is the information about the journal I used on Debbie Hodge's website. The questions were developed by Tami Taylor. I cut and pasted the questions to Microsoft Word so it would be easy to pull up a document and just answer the questions. I kept a separate document for each month but you could do one large file just keep it backed up. You could handwrite your answers as well perhaps in a pretty journal which would be a treasure to keep for the future. I think it will be especially interesting to look at this a few years down the road and perhaps answer the questions again to see what is the same and what has changed. Wow! I love this! I've just finished my third year of something similar. But I have an actual book with a question a day for 5 years. Same concept, just a word or sentence answer - I think the book is called "Sentence a Day". Thank you. Yes that does sound very similar. What I found interesting is that so much doesn't really change that much from year to year though I'm sure each of us has a different experience.